About 500 people from across New Brunswick gathered in downtown Fredericton on Friday morning to march in support of nursing home workers in their fight for higher wages. 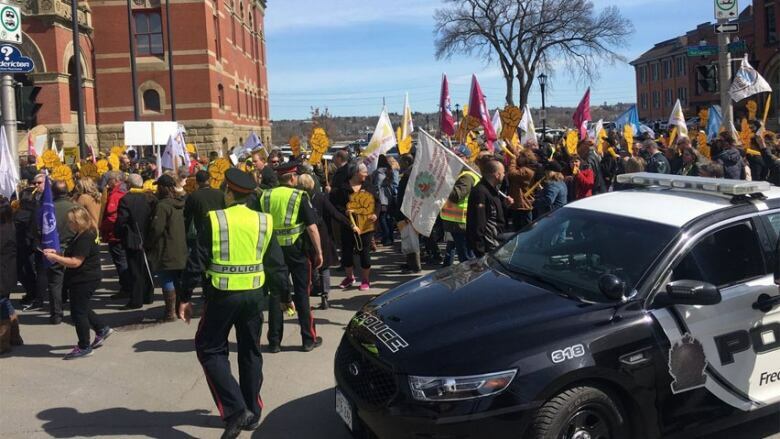 The March for Fair Wages was organized by CUPE, which represents the New Brunswick Council of Nursing Home Unions, but members of other public-sector unions who are also seeking to renew their collective agreements joined in. 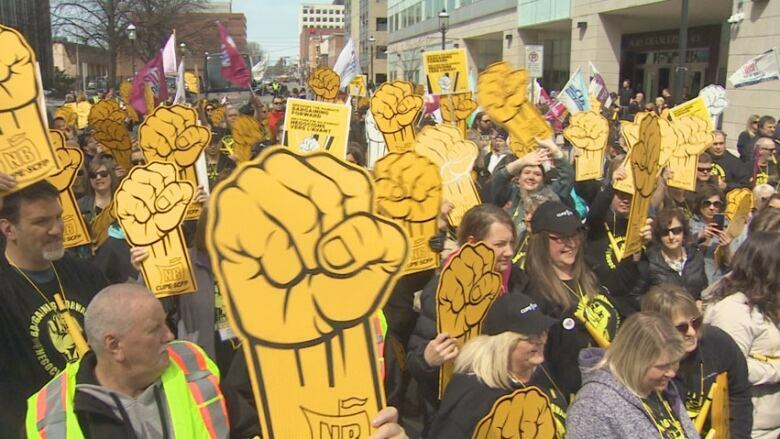 Many sported CUPE's black and yellow colours, pumped the union's fist-shaped yellow signs in the air as Fredericton police officers kept a close watch. "Show them what democracy looks like. This is what democracy looks like," they chanted. Close to 4,000 unionized nursing home employees in the non-profit sector voted overwhelmingly in favour of a strike a month ago, but a court order prevents them from doing so, and the government has refused to go to binding arbitration without a set of pre-arranged conditions in place. "We were expecting to hear back from the employer by the end of the week," the union said in a letter to its members. "Instead, we have heard from the mediator that the employer is working on a package, and he will contact us to return to the table once he has heard from the employer. "Until such time we will continue our activism." Social Development Minister Dorothy Shephard has said she is comfortable with staffing levels in nursing homes, so the marchers stopped outside her office and left a pile of old shoes, worn out as they say they are. "Our feet are tired and we need some new shoes," said Sharon Teare, president of the New Brunswick Council of Nursing Home Unions. The union wants a 20 per cent wage increase over four years, saying that's about a dollar-an-hour raise for a resident attendant. The government has limited wage increases to one per cent a year for the public sector — about 10 cents an hour. "We are worth more than 10 cents, so you can drop that 10 cents in the bucket and you can keep it," said Teare, as workers each dropped a dime in a bucket for the finance minister. The nursing home workers have been without a contract for 30 months. Nurses want fair wages too, said licensed practical nurse Jean-Francoise Hébert, who marched in solidarity. "We are united and we're not going away," said fellow nurse Jackie Sullivan. Paramedics were also out in force. "There's been cuts years after years after years," Steve Hébert said. "And they decided enough is enough, we're going to stand up today." Brien Watson, first vice-president for CUPE New Brunswick and president of Local 1253 of the New Brunswick Council of School District Unions, said members back the nursing home workers 100 per cent. "This whole province is united," he said. "I want to thank Mr. Higgs for doing that because he's brought this province together like we've never seen in this province before." The New Brunswick Court of Appeal is expected to rule next week on whether the nursing home workers can strike.